Does your mind wander and lose focus? Do you learn and retain facts as readily as you’d like? Are you able to use your mind to its full ability, acquiring and utilizing information when needed then stopping, resting and allowing a clear connection to insights and inspiration beyond your intellect? If your mental clarity or acuity is a concern, Feng Shui has strategies to assist. The mind is complex and can obtain information as well as reflect and generate insights and inspiration. Our intelligence offers two main areas of focus, one in the outer world, the other of a more inward perspective. Recognizing and working with these two viewpoints allows us to balance not only the mind but our overall being. The Knowledge and Self-Cultivation area, or gua (pronounced gwah), of the Feng Shui Bagua speaks to this very dynamic, identifying a place within our homes to improve the flow of energy to all mindful undertakings. A fundamental tool of Feng Shui, the Bagua Map offers a road map of both our homes and our lives. 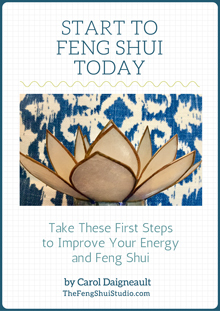 Map your home with my free Feng Shui Bagua Map download. Instructions on how to apply the Bagua to your home’s floor plan are provided. My series of posts on the Feng Shui Bagua also includes information on how to interpret your map as well as make adjustments when our home’s shape or other physical features are not ideal. In general, the Knowledge and Self-Cultivation area is associated with reflection, meditation, inner guidance, learning and studying. It also encompasses spiritual enlightenment, self-realization, and personal growth. This gua encourages us to cultivate an intelligent mind but to be prepared to assimilate this new knowledge by having a peaceful mind as well. We develop this through education coupled with introspection. This gua is derived from the trigram Ken, representing Mountain. A majestic icon symbolizing stability, grounding and stillness, the mountain energy is represented here along with the association of the very Yin season of Late Winter. Both connections ask us to be mindful and go inward to advance our lives. As you see, this Bagua area is providing an opportunity for us all to stop, study, reflect and secure the information we need to move forward in the world. We can look to our Knowledge and Self-Cultivation area for any number of specific matters. Although the Bagua Map can be utilized to decipher potential challenges in our lives, it is also a wonderful tool for setting and generating supportive energy to achieve a specific intention. Each Bagua area has its own unique use and specific enhancements. I cover each gua, such as Health and Family, Fame, Children and Creativity and others in their own individual posts. For now, let’s concentrate on situations that are most appropriate for this area. Look to this gua when undertaking training of any kind. Feng Shui asks us to team with our environment to improve energetic conditions for success. We do this for the situations above by placing a specific item associated with the underlying meaning of Knowledge and Self-Cultivation in that area of your home’s Bagua Map. Below are a number of suggestions of appropriate enhancements to locate in this part of the Bagua once your intention is identified. As you add any one of these items to your space, clearly state your intention to reinforce its successful attainment. This area of the Bagua is a great spot for study, meditation or doing yoga. Add a motivational saying to this area. Books of any type – including Feng Shui books! Here are a few Feng Shui items I recommend to increase your knowledge of this subject. If part of your intention is to increase your understanding and use of Feng Shui, any of these would also be an excellent enhancement for your Knowledge and Self-Cultivation gua. You can purchase any of these items by simply clicking on the images. Please be aware that I will receive a small stipend when you purchase any of these items. This gua is also a wonderful area of your home to place an altar. It can reflect your hopes and aspirations for just this particular area, or you may expand your vision and include symbols from any other life areas you wish. In order to attain a significant achievement in life, we must draw on our own current knowledge as well as the abilities we have cultivated over time. This realization leads us to not only appreciate but embrace the energy of this gua in almost all we do. I leave you with one of my favorite Feng Shui quotes, and hope that it will motivate all of you to find your special place between Heaven (Feng) and Earth (Shui). What knowledge, new skill, insight or achievement do you want to undertake? Is there something in your life that requires additional problem solving and support? With all you have just learned about this very important Bagua area, you can certainly start to improve a specific situation today by applying a Feng Shui remedy there. What ideas do you have and what item will you select to reinforce your intention for your Knowledge and Self-Cultivation? Comment below, and let us all know how you will utilize this very important resource. If you are unsure and think you require additional support to move forward, contact me for your own personal Feng Shui consultation. We can discuss and develop a plan for your individual situation. Feng Shui can open your world to a new level of ease and flow. Join me, and others in our Feng Shui community, by utilizing this ancient wisdom to create your Feng Shui home.